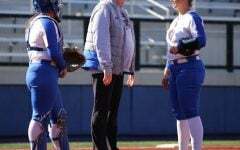 DePaul softball is still searching for consistency. 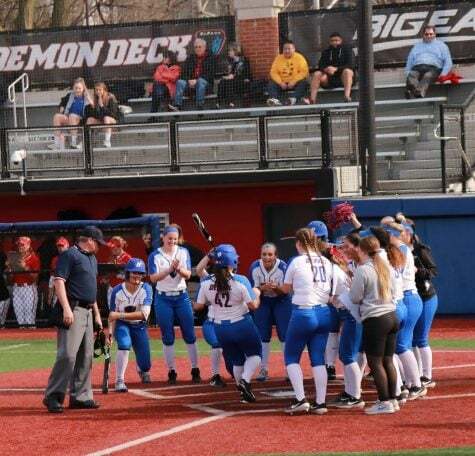 The Blue Demons (16-21, 7-3 Big East) dropped a doubleheader Saturday to Creighton, losing the first game 2-0 and then the second in a 5-3 thriller that went to an extra inning. In both games, DePaul didn’t make the extra plays when needed. 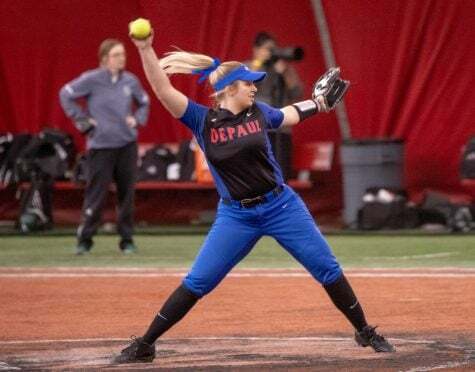 DePaul couldn’t salvage wins after two impressive performances from pitcher Mary Connolly and second baseman Morgan Maize. Connolly had the rare feature of pitching back-to-back, and was for the most part solid. Maize hit a homerun in the bottom of the seventh to tie the game on what would have been the final out if she missed contact and got a strike instead. But the rally was short lived as the Bluejays tacked on two more runs in the top of the eighth. The Blue Demons couldn’t muster the offense to match. In game one, Connolly (10-11, 5.21 ERA) struck out a season-high seven batters and only allowed four hits. Connolly’s lone error was when she gave up a two-runhomer to Creighton’s Blake Ringle in the top of the second. Ringle finished the game 3-for-3. Creighton (20-13, 5-7) kept DePaul’s offense in check during the first game. 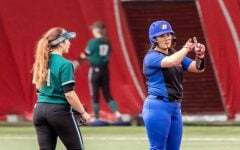 Pitcher Sydnee Eck allowed only three hits, and there were multiple instances where DePaul’s base runners were left stranded. 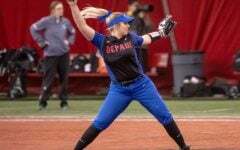 In the third inning, the Blue Demons had three consecutive flyouts after Ali Lenti and Maize were on first and second. 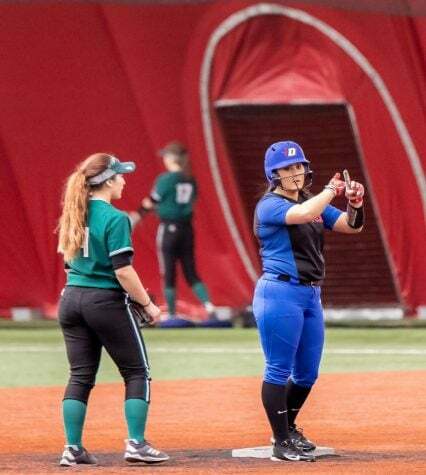 Later in the fifth, freshman Megan Leyva got caught trying to steal two bases, getting tagged out at third after a failed sacrifice bunt attempt from Brittany Boesel. For the past week, DePaul’s offense hasn’t been as strong as it has been in the past. On Tuesday, they lost 6-0 at home to Illinois. 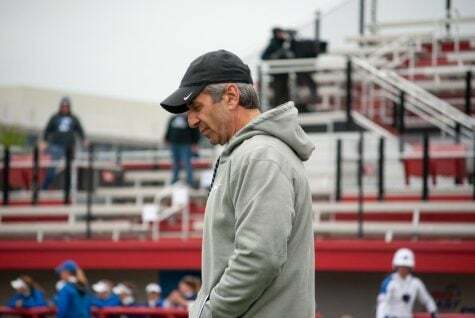 They rebounded with a 4-1 win over Loyola the next day, but DePaul has seen their offense come and go. “This year has definitely had its ups and down,” Chouinard said. “Sometimes the hitting has been fantastic and the pitching hasn’t been there. Or the pitching has been there, and the defense hasn’t been there. 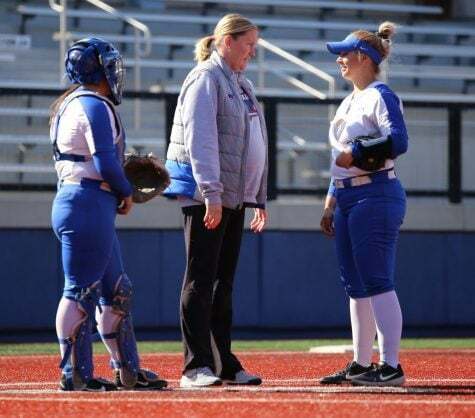 In the second game, it appeared that DePaul’s hitting woes had been cured. Junior Micah Fitzgerald got the Blue Demons on the board with a groundout RBI that brought Maize home in the second. Creighton starting pitcher Micaela Whitney was pulled after four innings, giving up one hit, one run and walking four with 18 batters faced. 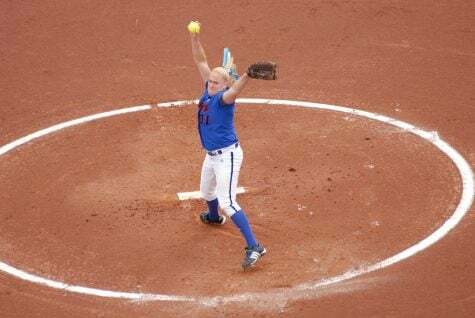 For the second half, Eck returned and gave the Blue Demons another handful, striking out five. The Bluejays also had a big sixth inning. A double from second baseman Anna O’Gorman brought in two runners, including shortstop Liz Dike. Dike went 3-for-4 and scored on three of Creighton’s five runs. 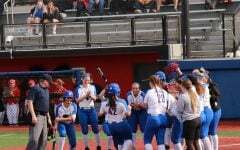 Trailing 3-1 in the bottom of the sixth, DePaul got a spark from pinch hitter Kali Gardner, who hit a solo shot deep into center field. It was Gardner’s fourth homerun of the season. Connolly retired the Bluejays in order to set the stage for Maize. 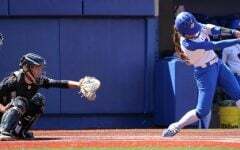 Maize hit a homerun into center field and went 2-for-4, continuing her hitting streak into 15 consecutive games. But the Blue Demons couldn’t hold on. Creighton first baseman Jen Daro had an RBI single to give the Bluejays a 4-3 lead. They also scored shortly after when O’Gorman got her second RBI of the game, scoring a runner with a sacrifice bunt. Connolly finished the second game with giving up nine hits, five runs, two walks and six strikeouts. 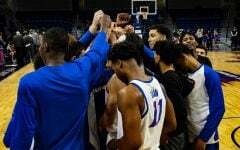 The loss was deflating for the Blue Demons, who have struggled after a 44-11 season last year. DePaul’s two losses to Creighton meant that it would be the first time since April 27, 2013 that they would lose a doubleheader at home in conference play. The Blue Demons have two weeks left in the season to right the ship before the Big East tournament. If DePaul plans on making the NCAA tournament again, it will have to be by securing the conference title. “We just want to see them be confident,” Chouinard said. 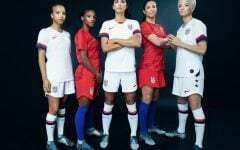 “We want to see them be capable of the way they can play. Really at this point, it’s up to the hands of the seniors, upperclassmen and the kids who will be playing. I’m confident they can do it.